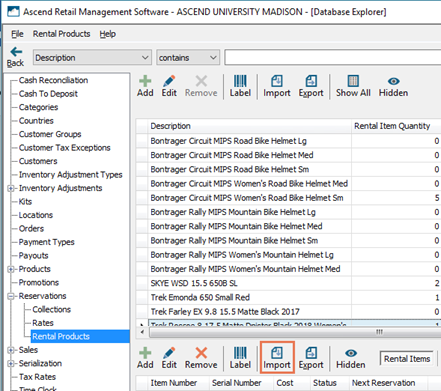 Download the Rental Item Import Template from www.ascendrms.com. a. ID: If you are importing new Rental Items, leave this field blank. If you exported your Rental Item list to edit your existing list, DO NOT edit this column. b. Item Number: Enter your store’s identifier for the item. c. (optional) Serial Number: Enter the item’s serial number. d. (optional) Cost: Enter the amount you paid for the item. e. (optional) Comments: Enter any additional information employees need to know about the item. f. (optional) Location: Enter the location in the store where the item is stored. g. Rental Product Description: Enter the description for the Rental Product with which the Rental Item is associated. h. Rental Product SKU: Enter the in-store SKu for the Rental Product with which the Rental Item is associated. Sherpa tip: If you're creating a new Rental Product alongside the Rental Item and you wish to use an automatically generated SKU, leave this field blank. Select the Rental Product for which you wish to import Rental Items. Sherpa tip: If you're creating a new Rental Product(s) alongside the Rental Item, select any existing Rental Product - you'll be prompted create any Rental Products which don't match your entries in the spreadsheet. On the lower toolbar, click the Import button. On the Import items prompt, click the OK button to confirm. 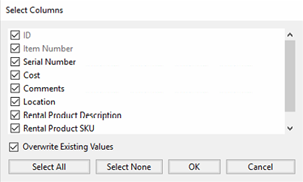 In the Select Columns dialog box, check the fields you wish to import and click the OK button. To select all fields, click the Select All button. To clear all selections, click the Select None button. To overwrite values for existing Rental Items and/or Rental Products, check Overwrite Existing Values. Sherpa tip: ID and Item Number are required and cannot be unchecked. 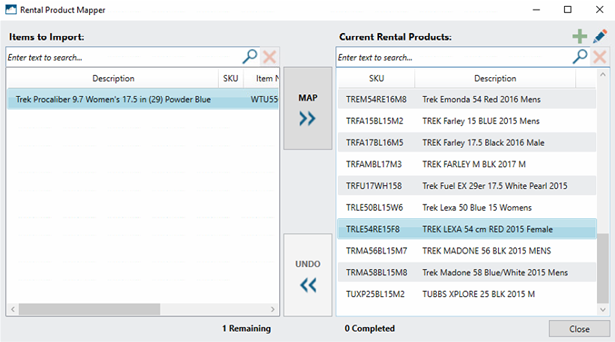 If an exact match cannot be found for the Rental Product information entered, the Rental Product Mapper displays. a. In the Items to Import column, select the Rental Items which are associated with the same Rental Product. b. In the Current Rental Products column, select the appropriate Rental Product. To add a new Rental Product with the information entered in the spreadsheet, click the plus icon. c. In the middle column, click the Map button. Sherpa tip: Click the Undo button to reverse the last action. d. When all Rental Items are mapped to a Rental Product, click the Close button.